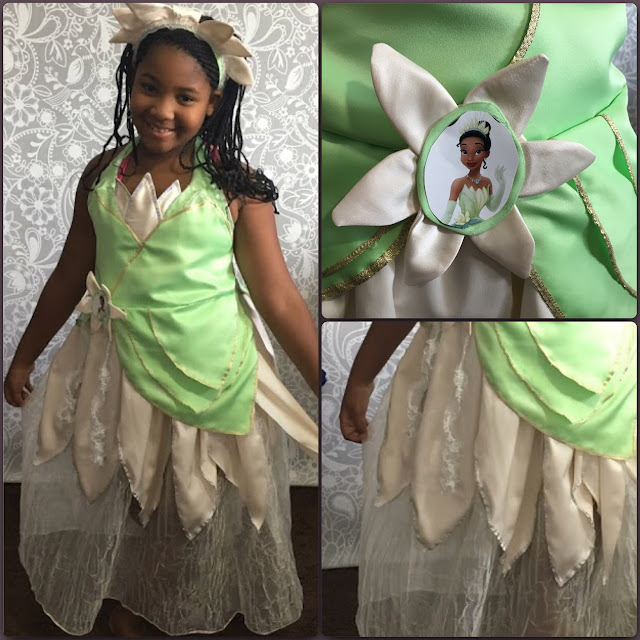 Sew-To-Fit by A.D. Lynn: The Princess and the Frog....Tiana my Darling!!! Child- "Hey, Mom, your Mini-Me is going to a summer camp!!!" Me- "That's great, I remember you going to camp. She is going to have so much fun!!! "When is she leaving?" Child- "In about two weeks!" Me- "Great, does she need anything?" Child- "No, I got it all taken care of, thanks though." Child- "OH, Hey, Mom, your Mini-Me leaves Sunday. She needs something simple for a "Disney Princess Ball" they are having at summer camp. Can you throw together a cape or something to go with her princess wand.?" 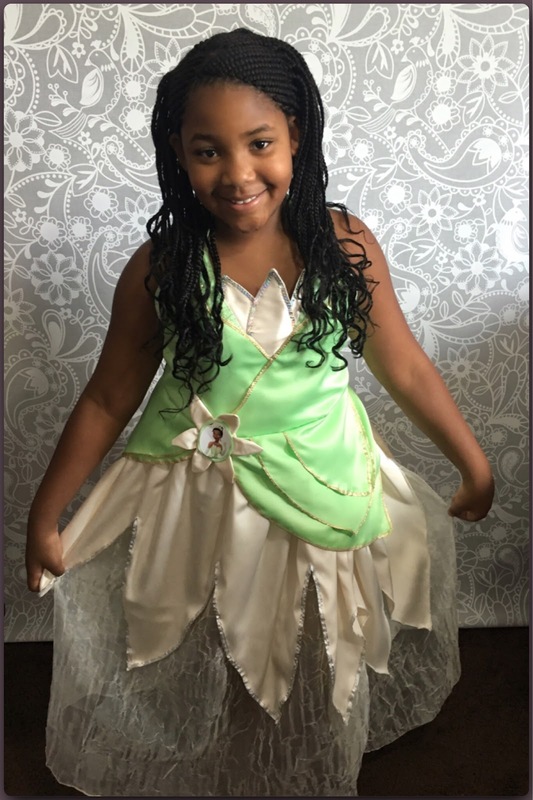 Do you honestly think I would just throw together some old stinkin' cape or just any ole thing for my Mini-Me to "represent" me at a "Princess Ball". If any of you have any idea the stakes on the table when you are 9 and headed off to a "new-to-you" summer camp. What goes through your mind at the thought of all the other girls wearing those gorgeous cheap "STORE BOUGHT" costumes and here you come in with some pieces of fabric thrown together. That is a bad look on our craft. There is no way!!!! Absolutely, no way I would allow her to go down in flames like that!!! I had to do something, right? I had to go all out, I had to let it be known that I am GrandMa....not to be mistaken for having the time to do for others, yet no time to really concentrate on my ONLY grandchild's costume. Oh, no, a statement must be made. Who out there knows what I mean? Who out there, knows what its like to WANT the best and know you can make it? I took the picture of the dress and Mini-Me and I went shopping for all the parts. She actually made sure I got the colors correct. I just made sure the fabric was proper for the outfit. JoAnn's Casa collection always is there for these type of costumes. They always make sure the right colors are in stock for the Disney princess costumes. 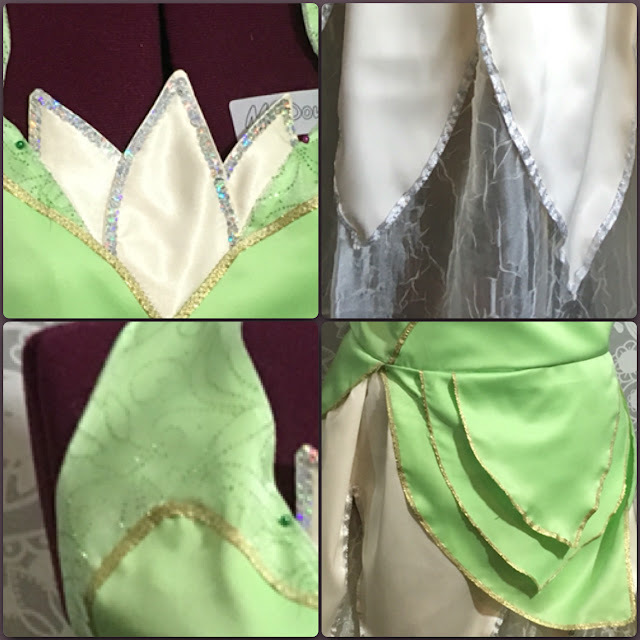 I did manage to pull out all the stops on this one and even create the petal layers on the front bodice and add trim to all the edges. Although, I did run out of some of my trim on some areas. But, who would notice that part, unless I told them. She was so very happy with this outfit, that her mom cried when she saw it while I was sleeping. Since, I did stay up all night Saturday working on this one. Only to take a short catnap Sunday morning at 6am until Mini-me was able to try it on before driving the two hours to camp. I do think, I earned probably a ga-zillion Grandma Browny points on this one here, both from my daughter and my mini-me. I, just might be more proud of this than I am my own makes. 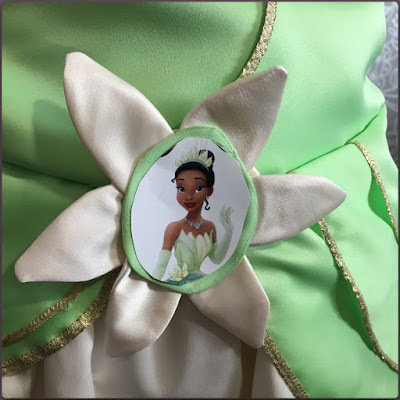 I was beaming with pride when she twirled......here in this video: "Princess Tiana Twirls". Oh for sure ....Absolutely a GaZillion browny points!!!!!! It is gorgeous and you so did make her happy. Beautiful!! Thank you Ann, I know you saw the periscope. She wanted to show you all her dress. Yeah, I'm thinking you you scored the points all right! But I just love your attitude of 'My-baby-will-have-the-best! Why should we not do our best for our precious babies?! On our vacation we drove from AZ to WA hauling my sewing stuff to make my grand nieces' graduation dress this year. I had not seen her in two years. After 3 twelve hour days the dress was done, the fit was perfect, and she was over the moon. That made me so happy, but the best part came when I over heard her say, "My family is SO awesome! Why doesn't she come up more often!" Your creation for your beautiful girl will provide sweet memories that will she will never forget. And as for whipping it out as fast as you did?! Well done, my hat is off to you!! Looking forward to more inspiration! Well thank you very much Deborah. That is awesome you drove that distance to sew for 3 straight days. It is amazing the feeling we get after doing something like that...it doesn't feel like work and for some reason we don't feel tired afterwards. Although, after we dropped her to camp, I came home and slept the entire day and night. Wow, that's real stunning princess dress. That little darling girl will remember this for the rest of her life with so much love for you. Kudos!! Thank you Andsewforth...you know my Love Bank is full right now. She was GORGEOUS and happy! You did a wonderful job! Thank you Faye. I can't wait to see the pictures from the camp party. Love it Myra...Grandma A!! I shall now be referred to as such. Thank you kindly. It's all that and two bags of chips with hot sauce and some Kool-aid! Don't Play!! LOL!! The twirl says it all! OMG Carol. You are so funny. Thank you. That's a fabulous dress. What a wonderful creation, and what a lucky little girl. Thanks Sew Nuts. She was so happy. How cute! It looks adorable! She looks very happy wearing this! Love it! I bought the adult Tiana pattern by Simplicity. I'm gonna be a Disney pricess for Halloween this year! That's awesome. I didn't even know they had a pattern for this one. You know how it is when you have a deadline. You are gonna be so cute. Yoy did an amazing job and she looked so Cute. OMG this is so gorgeous and so is your mini me. Of course you had to send her off to camp with the best grandma made outfit. amazing job and she will remember this FOREVER!